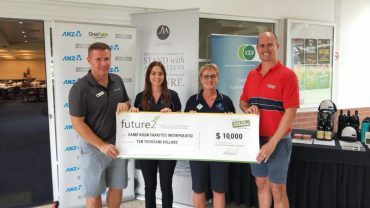 The WA Chapter held its Future2 Golf Day on 18 March, raising valuable funds for Future2. During the event, the WA Chapter presented a $10,000 cheque to Camp Kulin. Camp Kulin works with over 1,500 children across WA each year. A volunteer team run camps designed to support children who have been impacted by trauma including refugees and those affected by assault, suicide, and abuse by providing life skills to develop self-confidence, resilience, anger management and communication skills. The grant was endorsed by Michael Pyne CFP®. The cheque was presented to Camp Kulin’s counsellors by Michael Carmody CFP® and Christopher Shannon, Future2 WA Chapter Committee.